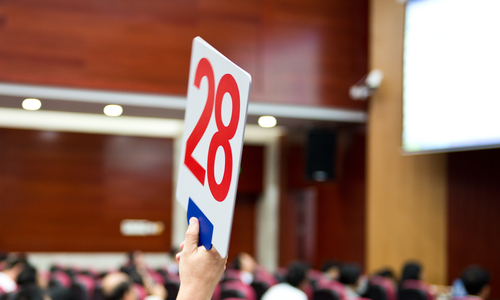 Buying a property at auction can be a daunting task. First it is advisable to get a catalogue of the auction before you attend and then inform the auctioneers which properties you would like to view before the auction. If you are interested in any of the properties, then it is a good idea to request the legal pack and then get one of our lawyers to look over it for you. It is also advisable to get your finances sorted out prior to the auction. You must have the ten percent deposit on the auction day and be prepared to find the remaining ninety percent within 28 days. You should be aware that buying at an auction is a legal commitment, so you should always seek legal advice.